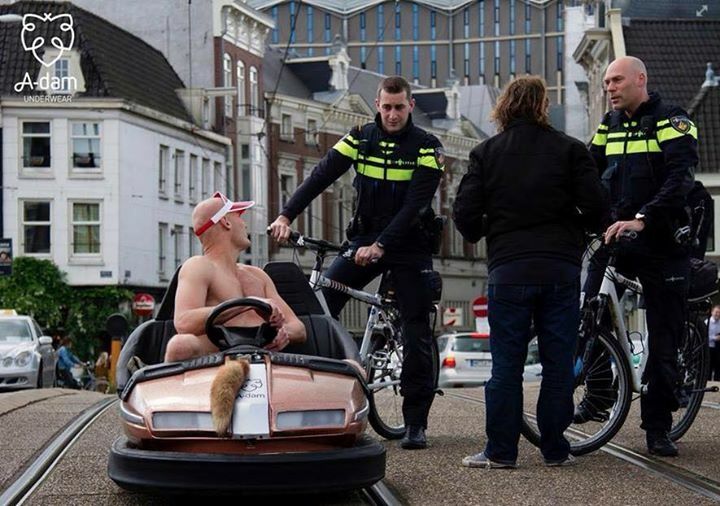 ...for underpants: make a self driving bumper car, put in nice looking guy just with underpants on, send him out to the streets of amsterdam. In America they confiscate flags, in Germany they take tanks and anti-aircraft guns. Too bad the tank's weapon systems didn't work. He could have defended his property when the government came to confiscate it. Drug-Related Underwear Thefts on the Rise. So, you usually have vandalism in trains, buses with scratching, tagging, hole digging in seats, etc. a funny coincidence was found by a bus operator. They added a free wlan offering on several of the buses operating longer overland school ways. The result was that the damages nearly stopped. When they noticed that, they put it in more and more of their buses to get similar results - successfull. Comparing the repair effort of the damages to the operational costs of the WLAN seems to be an easy calculation - it pays off. Heh... the vandalism likely happened out of boredom. With the Wifi available, the boredom went away (as well as the vandalism). Interesting! We should install Wi-Fi in Congress, then. Paid for by the taxpayers? I think not! I am sure they already have wifi so they don't have to pay attention to the proceedings. Now I am a kind, caring and compassionate person, I don't want their knees on the cold ground. A 2x4 on its side should be placed under their knees for comfort during the sessions. The public will be allowed to interact with the members of congress at any time, a government for the people by the people. I'd be in favor of reforming our voting system so we don't have this first-to-post crap. Since we don't have an "irony" room I'll post this here. The organizers of a "March Against Fear" planned in Brussels today was cancelled because of fear. It's almost as ironic as the feminist picnic which fell apart because no one made any sandwiches. You need to talk to someone who can create rooms and have them create an irony room. I used to be content with the knowlege that could never possibly happen, but the world has gone weird. I am from the state that came up with 3M - Texas mining and manufacturing. Good to see that M. C. has a gig. Good stuff.